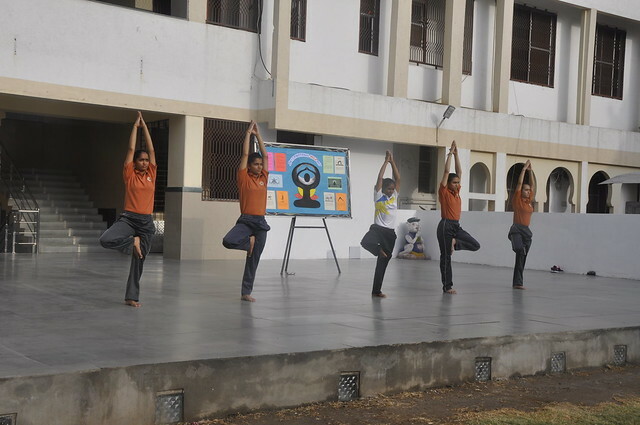 The Yoga Day was celebrated on 21 June 2018, with great enthusiasm and vigour in the school. All the students of the school, the principal, teachers and physical instructors assembled in the earmarked area in the morning itself so as to ensure that the yoga session is conducted in the most conducive manner even for the novice participant. The Yoga session started exactly at 7 am with Prayer, and systematic practice of different ‘asanas” of standing, sitting and laying positions (both lying on back and reverse) smoothly changing in succession under the instructions and supervision of Yoga teacher. Some of the asanas conducted are Surya Namskar, Todasana, Trikonasana, Katichakrasana, Paschimottanasana, Ardhmatsyendrasana and so on. The students not only enjoyed the practicing yoga but also were motivated to have regular practice of the same.